The Fen tower is located in the valley bottom in a wet sedge ecosystem, which includes Eriophorum angustifolium and dwarf shrubs such as Betula nana and Salix spp. The 3m tower is situated at 405938.720 E 7612178.324 N 899.668 elevation (UTM Zone 6N NAD83 datum in meters). 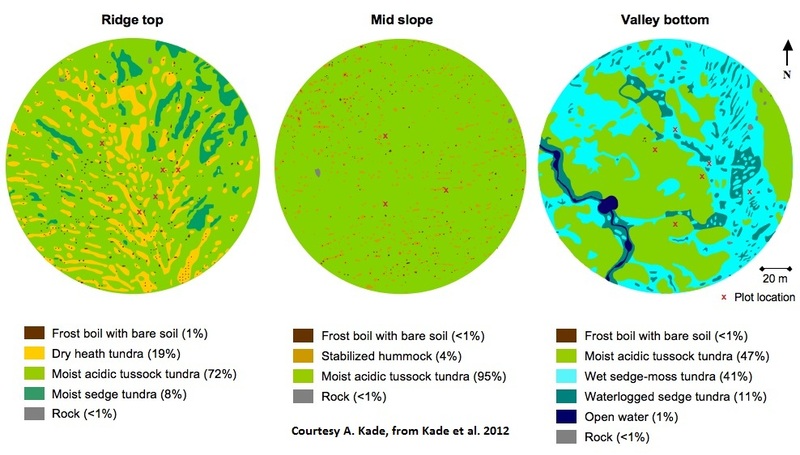 The vegetation in the tower footprint is comprised of 52% wet sedge, and 47% tussock tundra, with the balance being made up of open water and bare soil (see figure below). 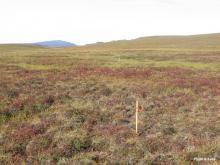 In June 2012, we will be adding methane flux monitoring cabability to this site. To see tower instrument details click here. The Tussock tower is located midslope in a moist acidic tussock tundra ecosystem, dominated by the tussock-forming sedge Eriophorum vaginatum, Sphagnum spp., and dwarf shrubs such as Betula nana and Salix spp. The 3m tower is situated at 406223.006 E 7612223.454 N 918.485 elevation (UTM Zone 6N NAD83 datum in meters). 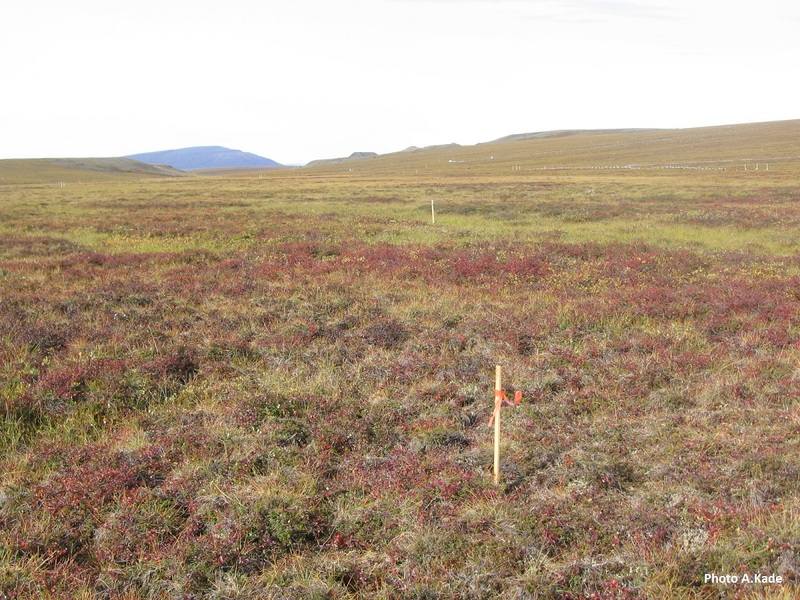 The Ridge tower sits atop a broad dry ridge at the top edge of the watershed boundary in a heath tundra ecosystem dominated by Dryas spp, lichen, and dwarf shrubs. The 3m tower is located at 406561.569 E 7612263.771 N 950.878 elevation (UTM Zone 6N NAD83 datum in meters). The vegetation here is 20% heath, but also included 72% tussock tundra, with the balance made of up of sedge meadow and bare soil (below). A webcam is aimed at this tower to monitor instrument icing and general conditions, also as a record of site phenology. To see tower instrument details click here. Vegetation mapped within each flux tower footprint (80m radius). The red 'x's mark location of collaborator's study plots.